The first thing that strikes me about the night tour on the hop-on-hop-off citysightseeing bus is that everyone on the upper deck is predominantly South African; and after some listening in on conversation, mostly Capetonian. 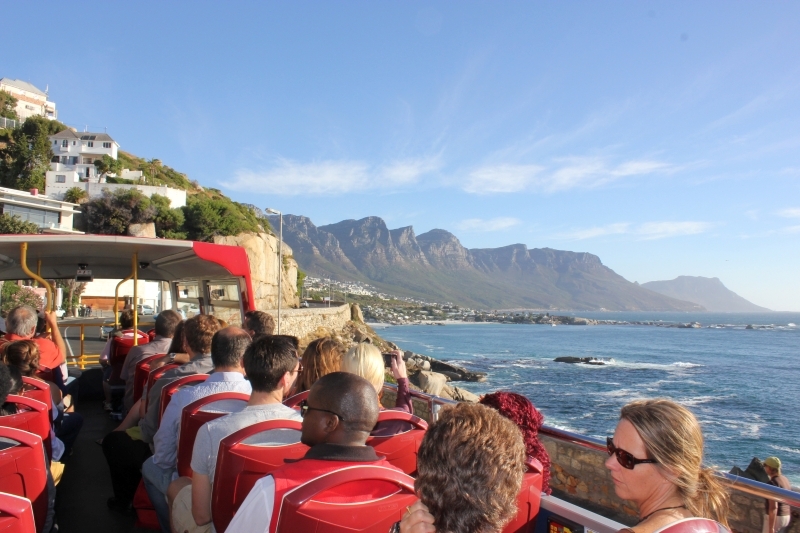 This probably isn’t the case with all the buses that leave outside the V&A Waterfront’s Two Oceans Aquarium, but I get the feeling that the sundowner trip is really popular with locals – it’s a little like a booze cruise, but on the deck of a bus. 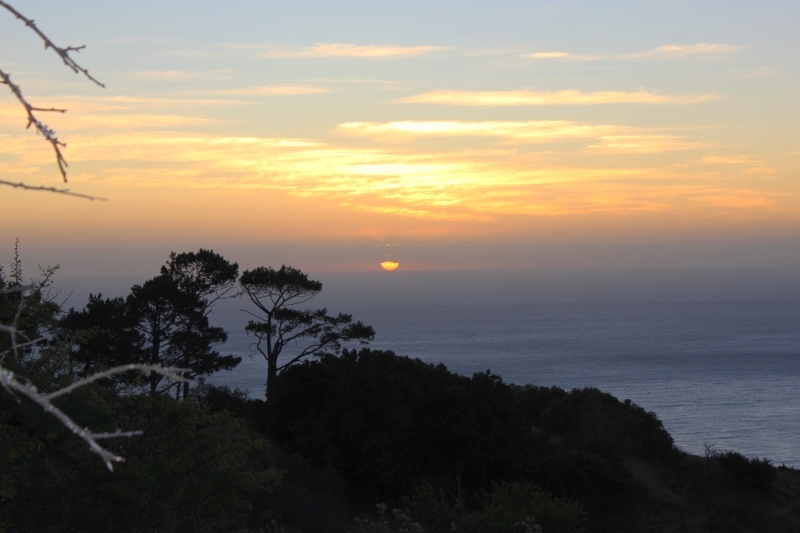 It’s also reasonable and you get to experience the Atlantic Seaboard in the gentle haze of twilight. There are people here who jump onto the bus still in their business attire, joining wives and friends who already have sundowners stored beneath their seats. It’s not really a hop-on-hop-off bus route. Everyone climbs on to remain on – the culmination of the not-long-ride being the top of Signal Hill for sundowners, after which we all clamber back on, into our same seats (more or less) for the ride back down. The number of buses leaving at 18h00 depends on the number of people who arrive for the pleasure of the route. Margaret, who sells us our tickets at the ticket office (we’ve run out of printer ink at home, so we’re paying the R10 extra for not having booked online whilst our son jumps up and down at the thought of being left behind) explains that as many as four buses have left at this time. No-one wants to sit downstairs -why would you? It’s the one time of day you can sit in the sun and not burn, and the views from up here are quite simply incomparable to doing the route by car. We finally leave (it’s beginning to get decidedly hot upstairs – why did I bring a fleece exactly?) 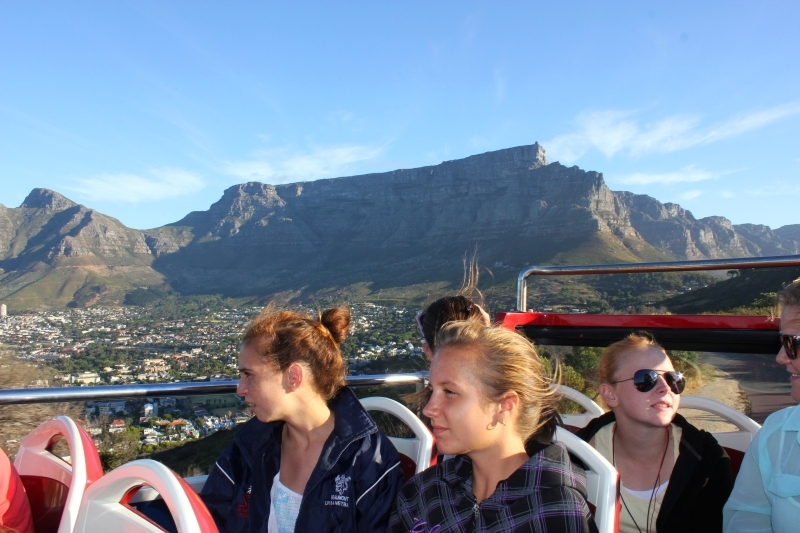 to follow the Atlantic Coastline via the V&A Waterfront, Sea Point, Clifton and Camps Bay. From up the top you can see over the edge onto the beaches of Clifton – including First and Second beach, which I’ve never managed to glimpse – into the windows of exclusive apartments and over the bars and restaurants where the trendy set hangout. I fairly gawp at it all, despite having driven the route by car umpteen times. From up on the top deck you get a totally different perspective. Add sublime views of the Twelve Apostles and you understand why this part of Cape Town has become such a playground for the wealthy. It really is glorious. We head from Camps Bay up the hill, and the wind hits. My hat almost goes flying as the force of it gusts down the channels between the rock faces of the mountains. From here we head up above Camps Bay to Signal Hill, entertained all the way, those of us who want it (for the clutch of school girls behind me couldn’t be bothered – they know Cape Town! ), by the commentary available via headphones. Despite the south easterly that I thought might have us use the alternative lower Table Mountain cableway station for our picnic, we arrive to find there is nominal wind on Signal Hill. The bus drivers affirm that they’ve never not stopped here due to wind or weather. But then the route is available only between September and May. We sit in groups on picnic blankets overlooking the sea, the sun slowly dipping in the east. More sublime you cannot get. We share our wine with José Maria from Mexico City. Mexico City, José Maria tells us, has a population of 23 million. I’m aghast. We’re planning on visiting our great grandparents in New Zealand later this year where the entire population of both north and south islands amounts to a meagre 4.4 million. I thought Cape Town was busting at the seams at 3.4 million! José Maria is here on a whim. Meeting his girlfriend, who has recently become an ex, in Italy no longer an option, he’s taken the advice of a friend and is now on the African continent. The sun dips, appears again and the heads down towards Mexico. We salute the sun with our glasses, pull on our now necessary fleeces and shiver our way to the bus for the rest of the route, over Kloofnek, up Adderley Street and home. I’d do it again at the drop of a hat. Ive been working in Cape Town for most of my career life, and ever since I saw the RED HOP ON HOP OFF BUS i told my hubby I want to be on that bus. Can you please forward me your prices and where can we HOP ON,cause myself and my husband has never gone on a Honeymoon and that bus tour will do us wanders.